Overlooking the beach with 287comfortable holiday bedrooms. Facilities include indoor and outdoor pools, Kids Club and playground, games room, sauna and steam baths, mini-golf. Discount rates online. The popular 3-star Hotel Auramar Beach Resort with 287 comfortable holiday bedrooms is only a few metres away from the beach and overlooking the deep blue Atlantic Ocean. The Resort lies in one of the most breathtaking spots of the Algarve in the splendid setting of the Praia dos Aveiros. The hotel is located just 10 minutes away from centre of the old part of Albufeira. Although, basically still a fishing village it has become a typical tourist town for tourism over the years with countless bars and restaurants. The Hotel Auramar Beach Resort offers a relaxing holiday away from the bustle of tourism and providing all the services and facilities in a modern holiday programme. There are an indoor and outdoor pool, sauna and steam baths, a Kids Club plus play area, a games room and mini-golf. signs to Portimão/Lisboa until you reach the A22 motorway. - After passing the exit for Lisbon, take the first exit that you see to Albufeira. Follow the signs to Albufeira . 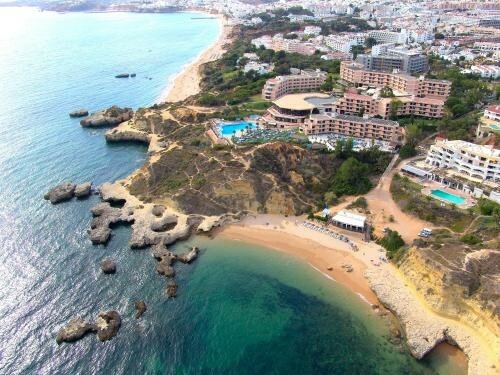 - Upon arrival in Albufeira turn left and carry straight on until you see the Oura Hotel. - Before this hotel turn right and carry straight on until you see 3 palm trees. - Turn left and then follow the signs to Auramar. This room has a double bed or twin beds and a side sea view. Please note that the double bed is subject to availability.